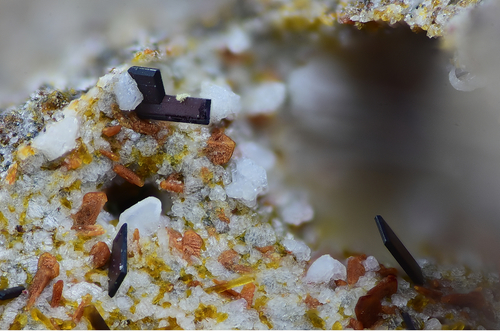 Hexagonal crystals of hematite and black tablets of pseudobrookite. Yellow crystals of amphibole are also present. The right hematite is partly overgrown by an unknown mineral, so the surface of this hematite shows an interesting feature. This unknown mineral is maybe opal. In the background of this photo sitting a structure on pseudobrookite crystal which could also be an opal. Collection & photo Martin Reich. Nikon D7200, Seiwa M Plan Apo 10x SLWD, DCR 150 reverse, bellows, WeMacro rail. Camera remote with digiCamControl. ZereneStacker (stack of 165 images - DMap & PMax). 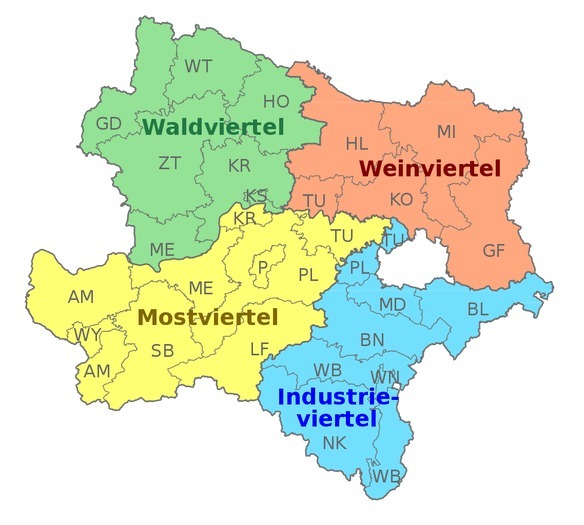 Map of the Austrian state Niederösterreich (Lower Austria) with coloured characterisation of the 4 "quarters" which are not administration units. The shortcuts showing the units of the counties with their borders which are administrative/political units. 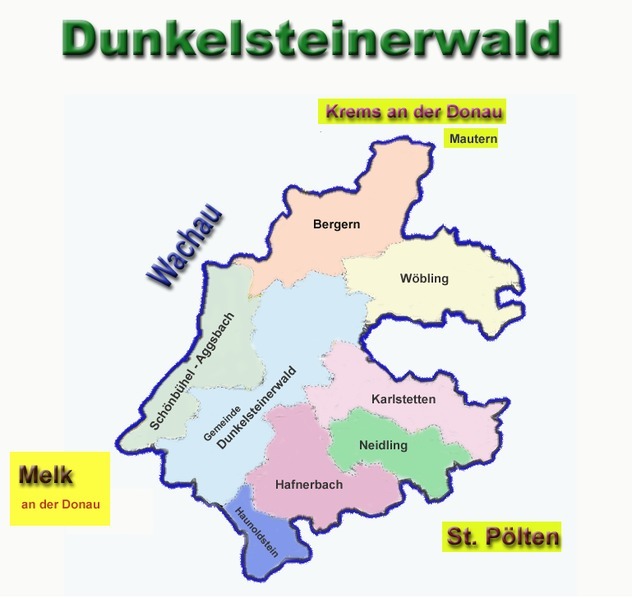 Map of the area Dunkelsteinerwald with implying municipalities. Pseudooctahedral hematite crystals. 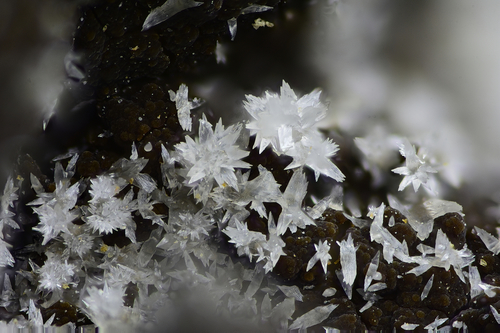 In fact these crystals are showing a combination of a rhombohedron with the basal face. 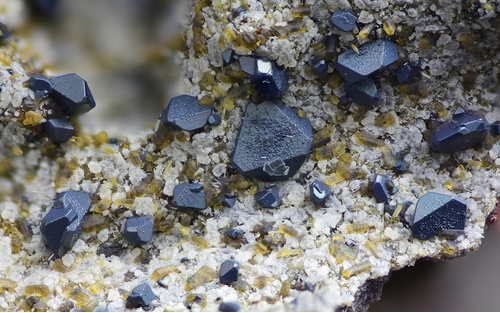 Some of the hematite crystals are twinned with (0001) as twin plane. Yellow amphibole crystals are also part of the paragenesis. Nikon D7200, Seiwa M Plan Apo 10x SLWD, DCR 150 reverse, bellows, WeMacro rail. Camera remote with digiCamControl. ZereneStacker (stack of 78 images - DMap). 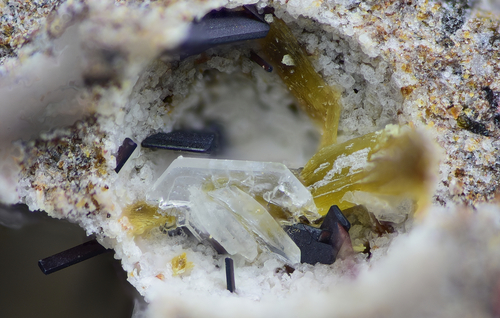 Colourless hexagonal tridymite crystals associated with blackish tablets of pseudobrookite and yellow amphibole in a bubble shaped cavity. Nikon D7200, Seiwa M Plan Apo 10x SLWD, DCR 150 reverse, bellows, WeMacro rail. Camera remote with digiCamControl. ZereneStacker (stack of 67 images - DMap & PMax). 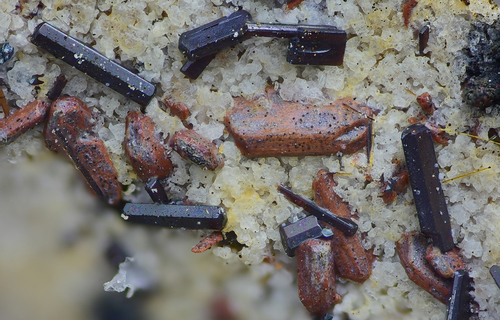 Black tablets of pseudobrookite with white aggregates of tridymite. 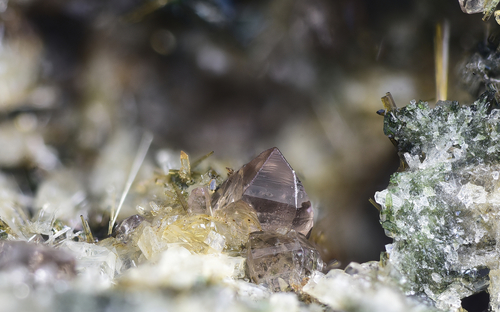 The base contents brownish crystals of forsterite and yellow crystals of amphibole. Nikon D7200, Seiwa M Plan Apo 10x SLWD, DCR 150 reverse, bellows, WeMacro rail. Camera remote with digiCamControl. ZereneStacker (stack of 117 images - DMap & PMax). 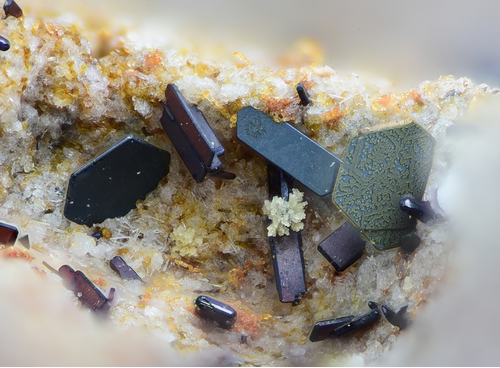 Black tablets and prismatic crystals of pseudobrookite with brown forsterite which colour is caused by alteration. Nikon D7200, Seiwa M Plan Apo 10x SLWD, DCR 150 reverse, bellows, WeMacro rail. Camera remote with digiCamControl. ZereneStacker (stack of 85 images - DMap & PMax). Nikon D7200, Mitutoyo M Plan Apo 5x ELWD, DCR 150 reverse, bellows, WeMacro rail. Camera remote with digiCamControl. ZereneStacker (stack of 37 images - DMap). 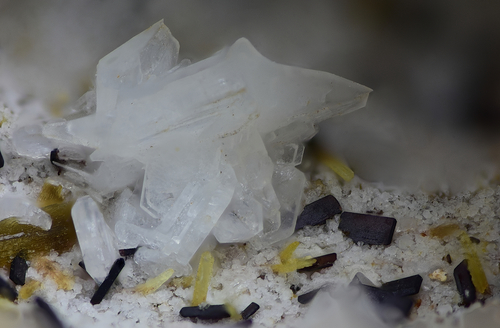 White aggregate of tridymite associated with black tablets of pseudobrookite and yellow needles of amphibole. Nikon D7200, Seiwa M Plan Apo 10x SLWD, DCR 150 reverse, bellows, WeMacro rail. Camera remote with digiCamControl. ZereneStacker (stack of 128 images - DMap & PMax). Star like aggregates composed of steep rhombohedrons of calcite. Collection K. Pirabee, photo Martin Reich. Nikon D7200, Seiwa M Plan Apo 10x SLWD, DCR 150 reverse, bellows, WeMacro rail. Camera remote with digiCamControl. ZereneStacker (stack of 78 images - DMap & PMax).